We’d love your help. Let us know what’s wrong with this preview of Yarn Bombing by Mandy Moore. To ask other readers questions about Yarn Bombing, please sign up. Now, I know I'd never have the courage to start up a yarn bombing group, but if I heard of one locally, and if I had stashes of yarn available that I didn't have to pay for, then I'd be in like a shot. Why Yarn Graffiti is the Bomb = a history of yarn bombing, which includes illustrations of an intricately covered motorbike, and a covere What fun! Flights of Imagination = more of the truly remarkable. Page 204 has a photo of pink-covered tank (of the military type); page 209 shows an artist knitting a gigantic American flag using 2 cranes and lamp posts; pages 222 & 3 have a bus in Mexico City. Read the interviews with yarn bombers and look at the pretty pictures; skip the self-important nattering about how to pick your yarn bomber name and how you should deal with people who "don't understand the importance" of yarn bombing -- especially since the authors don't make much of a case for it themselves. You don't have to know how to knit or crochet to enjoy this book but you might want to learn how to by the end. There was a sculpture set of plaster figures on an old railroad train station which was called 'Waiting for the Night Train' One winter, the stark white figures suddenly gained bright red scarfs. And for years, every winter, the statues received new scarfs. I had been exposed to yarnbombing before I even knew the phrase. This book is stuffed with pictures, interviews with 'bombers' and m You don't have to know how to knit or crochet to enjoy this book but you might want to learn how to by the end. This book is stuffed with pictures, interviews with 'bombers' and members of their groups across the world, a few knit plans, and importantly, some advice about dos and don't. Cover a fire hydrant - no! Cover a parking meter - no! Cover a parking meter pole - sure! Cover a hand rail - okay. Cover a bit of a light pole - okay. Cover a bike rack rail - yep! To always be aware of the line between 'beautify' and 'hinter or restrict accessibility' especially with items needed to keep us safe. Otherwise, there is really no real restriction on what can be yarnbombed and there are pictured examples - the huge pink tank cosy (yes, they covered a tank), covered a full-size bus, a colorful sweater for a rock on the beach, a tiny knit mushroom along a walkway in the woods, legwarmers on a metal deer. An interesting book, full of beautifully-shot photos for inspiration. Though I don't much see the point in the few detailed 'patterns' for creating what is such an individual 'art'. The photos themselves were enough inspiration for me, without needing patterns. The latter part of the book gets into some really LARGE projects and ideas, which are beyond my interests. The authors also went over-long into how to gather a crew, how to name it, and how they're just 'so misunderstood' (my paraphrase). An interesting book, full of beautifully-shot photos for inspiration. Though I don't much see the point in the few detailed 'patterns' for creating what is such an individual 'art'. The photos themselves were enough inspiration for me, without needing patterns. I have a latent fascination with yarn bombing but lack the guts to try it myself....yet. I loved reading these ideas for tasteful outdoor decorating with knit and crochet creations. Thinking of decorating my Japanese cherry tree with pink blossoms next winter! 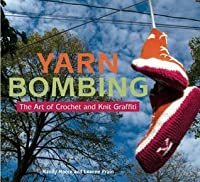 I loved this book, loved learning about graffiti knitting in all it's forms and looking at all the beautiful patterns - looking forward to making my won yarn-bomby changes in the world! Yarn Bombing is an extremely inspirational and creative book. It got my knitting juices flowing and made my hands itch for the needles when I saw pictures of colorful yarn knit into… beautiful graffiti? Yes, yarn graffiti. Yarn Bombing is a rather large thing in big cities and even other countries where knitting is prominent, especially Sweden (see links below). Yarn Bombing has many fantastic pictures, ideas for bombing, some basics for getting started, points and tips, advice on what to say if you get caught in the act (either by passer-bys or police), interviews with yarn bombers, and some patterns. 2. Open a bottle of wine. 3. Knit every row until sober. There are patterns in the book for knitting items for yourself, such as arm warmers, hoods that cover your whole face except your eyes (so you can be a ninja-yarn-bomber!) sweaters, and some other stuff. Some of the bombing patterns include treesweaters, knit tulips and mushrooms, Knit sneakers to hang over wires, Bolo balls, Elf Stockings, and more. I give it a 4/5 because, considering that graffiti is illegal and I’m perusing Criminology… let’s just say that I’m being gracious. (and I’m actually considering giving this a try… I’ll keep you posted on that one ;). Also, it was laid out a little odd and it was a bit hard to find some things. Lastly it didn’t have quite as many patterns as I expected. But, all in all, it was an awesome craft book! Recommendation: knitters and Crocheters of any age, anyone interested in graffiti or contemporary art. Here are some links to some yarn-bombers that you should check out, there are tons more! Follow the links you find on their blogs and explore the yarn-bombing community. In the area where I live yarn bombing is becoming quite popular. Fences, bike racks, poles, parking meters and trees are all being decorated by yarn graffiti. It has even come to the attention of the local newspaper. Being an occasional knitter, and having some extra time up my sleeve the idea of beautifying the council with knitted handiwork is appealing. Yarn Bombing by Mandy Moore and Leanne Prain is just what I need to get some inspiration and get started. Like regular paint graffiti, yarn g In the area where I live yarn bombing is becoming quite popular. Fences, bike racks, poles, parking meters and trees are all being decorated by yarn graffiti. It has even come to the attention of the local newspaper. Being an occasional knitter, and having some extra time up my sleeve the idea of beautifying the council with knitted handiwork is appealing. Yarn Bombing by Mandy Moore and Leanne Prain is just what I need to get some inspiration and get started. Like regular paint graffiti, yarn graffiti has different purposes from activism, to tagging and decoration and this book gives lots of examples of these purposes. The book includes interviews with prolific yarn bombers, their reasons for engaging in yarn art and their styles of graffiti. For me the most important part is how to get a crew together and take my yarn into the street. There is a chapter on how to decide on patterns, measuring your tagging targets, attaching your yarn and what to do if you are caught! Although patterns and tags differ depending on your target the book gives loads of patterns. There are patterns for basic rectangular tags for those new to knitting/crocheting or new to yarn graffiti and they progress to master tagging patterns such as hanging shoes (as seen on the cover) to mushrooms and elf stockings. What a little gem, a fun and interesting introduction to the world of yarn bombing, or knit graffiti, or installation art. This book describes the history and evolution of this cultural phenomenon, and introduces us to some of the artists at the epicenter. I loved all the pictures, and the interviews, and even the patterns, although the patterns were really secondary. I think the patterns were more an effort to reach beginners than the primary goal of the book, and it was reiterated frequently t What a little gem, a fun and interesting introduction to the world of yarn bombing, or knit graffiti, or installation art. This book describes the history and evolution of this cultural phenomenon, and introduces us to some of the artists at the epicenter. I loved all the pictures, and the interviews, and even the patterns, although the patterns were really secondary. I think the patterns were more an effort to reach beginners than the primary goal of the book, and it was reiterated frequently that everything was meant as a springboard for the knitter's imagination. By far my favorite chapter was the last one, the big ideas chapter, where people covered tanks and freeway overpasses and used cranes and giant knitting needles. Very exciting, and I love installation art, and public art pieces of all kinds. It has pretty pictures, some nice patterns, and good interviews. It has one of the better cardigan designs I've seen. There is a wonderful sense of humor throughout the book - even in the pattern instructions. It's a library rental I'll probably go out an purchase. My only caveat is that it ignores a lot of the issues of class appropriation happening in knit graffiti (which some people did bring up when they saw me reading this). I don't think it's wrong to yarn bomb. I've been considering starti It has pretty pictures, some nice patterns, and good interviews. It has one of the better cardigan designs I've seen. There is a wonderful sense of humor throughout the book - even in the pattern instructions. It's a library rental I'll probably go out an purchase. I am using this in my Women, Art and Culture class. Like many things about it, and about its discussions of street art especially. Love the artists included! The web stuff is excellent too. Am slightly taken aback by the commercialism of it? is that the right word? or maybe it just shows how narrow my range of act activisms is, or radical action, or feminisms. I would like to understand this aspect better. And perhaps I am not smart enough about commercial success and also about how to include pe I am using this in my Women, Art and Culture class. Delightful: just my kind of projects. This is a very inspiring book, with brief profiles, interviews and tips from established and formal yarn bombers, plus patterns and lots of photos of basic tags. The instructions don't assume any particular skill level, but they're good about providing links to more information where needed. I hope the book proves popular in the library-we've certainly got plenty of yarn users in town who might be inspired. I enjoyed reading how yarn bombing came about, I am not so certain I would go out and put something I worked so hard on something where people would take it and destroy it because they don't like it, but I would be interested in making a sweater for my tree out front...it is looking a little cold some days. I would also love to make some elf shoes to hang in my trees, So I would have fun putting these things in my yard. Now to start planning. All over the place yarn graffiti artists are leaving their art around trees, chain link fences, parking meters, and the like. Some yarn artists tag street lights and others public monuments. Some yarn art is political (The Pink M.24 Chaffee) while other rather cheeky (like Chelsea Gunn's "Monster Feet"). Best of all- yarn graffiti is unexpected and fun. Read this book for inspiration and pick up your needles (or hooks) stat! I like the idea of this text, and it explores the culture of Yarn Bombing quite well. However, while it's certainly fun, the very concept of yarn bombing seems wasteful to me, as there are so many better things one can make/do with the yarn (blankets for the homeless, hats and gloves for women's shelters, etc.). I like the concept, the idea to make crochet and knitting somehow rebellious, but I also find myself questioning it. So it's not great literature. But boy, is it inspiring. I showed it to a client that suffers from depression and she was tickled by all the pictures. Yes, it's true many of the "sneaky" patterns seem a bit useless, but I really love the chainlink weave pattern (one of the few useful ones) and am going to give it a try. Inspired to start a crew. Yep. Not bad for a book. Yes, Shane the term itself has an irritating quality, but I am an unapologetic fan,none the less. I prefer to think of it in the growing movement is what I know think of as Fancyfying! Fancyfying combines all impulses to decorate the world around us, for no other reason than the satisfaction of doing so! Fancyfye somewhere near you soon. This book introduced me to yarn bombing. And through yarn bombing I've met and worked with amazing people and have really enjoyed my time in the fiber community. A great book with quiet a bit of humor and some fun patterns. This book should be considered the Bible of Yarn Bombing. Who would have thought there would be a book on such a subject? It's fun, engaging, straightforward, concise, and entertaining. In fact, it's so good it is overdue at the library. I can't seem to let it go. Terrifically fun idea, and I love the plea for unity between knitters and crocheters. I don't think the sweet and folksy nature of yarnbombing needs so much mock street attitude to be entertaining, but a lot of people are obviously having fun and the pictures are great. It's not my thing, but very interesting to read about. Also, I love the crocheted flowers near Denver's Union Station construction project, so it was worth the read to learn a little more about that group.